अरबी सुलेख जिसका अर्थ है "अली को छोड़कर कोई बहादुर युवा नहीं है और वहां कोई तलवार नहीं है जो जुल्फिकार को छोड़कर सेवा प्रदान करती है।"
Rawze-e-Sharif, the Blue Mosque, in Mazari Sharif, Afghanistan – where a minority of Muslims believe Ali ibn Abu Talib is buried. ↑ अ आ Al-Islam. "The Life of the Commander of the Faithful Ali Ibn Abu Talib (as)". अभिगमन तिथि 6 December 2015. ↑ Rahim, Husein A.; Sheriff, Ali Mohamedjaffer (1993). Guidance From Qur'an (अंग्रेज़ी में). Khoja Shia Ithna-asheri Supreme Council. अभिगमन तिथि 11 April 2017. ↑ Shad, Abdur Rahman. Ali Al-Murtaza. Kazi Publications; 1978 1st Edition. Mohiyuddin, Dr. Ata. Ali The Superman। Sh. Muhammad Ashraf Publishers; 1980 1st Edition. Lalljee, Yousuf N. Ali The Magnificent. Ansariyan Publications; January 1981 1st Edition. ↑ Sallaabee, Ali Muhammad. Ali ibn Abi Talib (volume 2). पृ॰ 621. अभिगमन तिथि 15 December 2015. ↑ Biographies of the Prophet's companions and their successors, Ṭabarī, translated by Ella Landau-Tasseron, pp. 37–40, Vol:XXXIX. ↑ Sallabi, Dr Ali M (2011). Ali ibn Abi Talib (volume 1). पपृ॰ 52–53. ↑ अ आ Sahih Muslim, Book 21, Hadith 57. ↑ Kelen 2001, पृष्ठ 29. 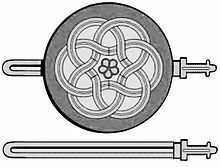 ↑ Watt 1953, पृष्ठ xii. ↑ Razwy, Sayed Ali Asgher. A Restatement of the History of Islam & Muslims. पृ॰ 72. ↑ Lapidus 2002, पृष्ठ 47. ↑ Holt, Lambton & Lewis 1970, पृष्ठ 70–72. ↑ Tabatabaei 1979, पृष्ठ 50–75 and 192. ↑ अ आ Dakake 2008, पृष्ठ 34–39. ↑ Razwy, Sayed Ali Asgher. A Restatement of the History of Islam & Muslims. पपृ॰ 35–36. ↑ Glubb, Sir John (1970). The Life and Times of Mohammed. ↑ Ashraf 2005, पृष्ठ 5. ↑ Illustrated Dictionary of the Muslim World (अंग्रेज़ी में). Marshall Cavendish Reference. 2011. आई॰ऍस॰बी॰ऍन॰ 9780761479291. अभिगमन तिथि 11 April 2017. ↑ Ashraf 2005, पृष्ठ 6 and 7. ↑ Razwy, Sayed Ali Asgher. A Restatement of the History of Islam & Muslims. पृ॰ 43. ↑ अ आ इ ई उ ऊ ए Tabatabaei 1979, पृष्ठ 191. ↑ Ashraf 2005, पृष्ठ 14. ↑ Pickhtall, Marmaduke (1975). Introduction to the Translation of Holy Qur'an. Lahore. ↑ Andre, Tor (1960). Mohammed, the Man and his Faith. ↑ "Ali". 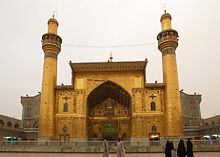 Imamali. मूल से March 20, 2015 को पुरालेखित. अभिगमन तिथि March 20, 2015. ↑ Razwy, Sayed Ali Asgher. A Restatement of the History of Islam & Muslims. पृ॰ 54. ↑ Razwy, Sayed Ali Asgher. A Restatement of the History of Islam & Muslims. पपृ॰ 54–55. ↑ Razwy, Sayed Ali Asgher. A Restatement of the History of Islam & Muslims. पृ॰ 55. ↑ Irving, Washington. The Life of Mohammed. ↑ Ashraf 2005, पृष्ठ 16–26. ↑ Ashraf 2005, पृष्ठ 28 and 29. ↑ Tabatabaei, Sayyid Mohammad Hosayn. "Tafsir al-Mizan, Volume 3: Surah Baqarah, Verses 204–207". almizan.org. मूल से June 17, 2009 को पुरालेखित. अभिगमन तिथि November 25, 2010. ↑ Ashraf 2005, पृष्ठ 30–32. ↑ Mehboob Desia. Islam and non-violence. Gyan Book Pvt Ltd. पृ॰ 150. आई॰ऍस॰बी॰ऍन॰ 81-212-1026-7. ↑ Singh 2003, पृष्ठ 175. ↑ Madelung 1997, पृष्ठ 14 and 15. ↑ "Hazrat Mohsin Ibn Ali (a.s.): A Victim of Oppression and Terrorism". Serat Online. SeratOnline. अभिगमन तिथि 17 June 2018. ↑ Masoodi. Isbaat al-Wilaayah. पृ॰ 142. They attacked Fatimah’s (s.a.) house. They crushed the Chief of All Women behind the door so violently that it resulted in the miscarriage of Mohsin. ↑ al-Qurashi, Baqir Shareef (2006). The Life of Fatimah Az- Zahra', The Principal of all Women: Study and Analysis (First संस्करण). Qum. Imam Ali (a.s.) often helped Fatimah (s.a.) in the house affairs. ↑ al-Qurashi, Baqir Shareef (2006). The Life of Fatimah Az- Zahra', The Principal of all Women: Study and Analysis (First संस्करण). Qum: Ansariyan Publications. The life of Imam Ali (a.s.) and Fatimah (s.a.) was full of love and friendliness. ↑ al-Qurashi, Baqir Shareef (2006). The Life of Fatimah Az- Zahra', The Principal of all Women: Study and Analysis. Qum: Ansariyan Publications. ↑ Bihar al-Anwar, Volume 43. पृ॰ 133. ↑ Razwy, Sayed Ali Asgher. A Restatement of the History of Islam & Muslims. पपृ॰ 136–137. ↑ Razwy, Sayed Ali Asgher. A Restatement of the History of Islam & Muslims. पृ॰ 139. ↑ Khatab, Amal (May 1, 1996). Battles of Badr and Uhud. Ta-Ha Publishers. आई॰ऍस॰बी॰ऍन॰ 978-1-897940-39-6. ↑ Ibn Al Atheer, In his Biography, vol 2 p 107 "لا فتی الا علي لا سيف الا ذوالفقار"
↑ अ आ Qur'an 3:61. Madelung 1997, पृष्ठ 15 and 16. ↑ Tabatabaei, Sayyid Mohammad Hosayn. "Tafsir al-Mizan, v.6, Al Imran, verses 61–63". 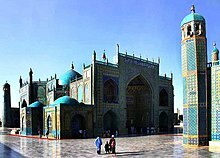 almizan.org. मूल से June 17, 2009 को पुरालेखित. अभिगमन तिथि November 25, 2010. "من كنت مولاه فهذا علي مولاه"
↑ Dakake 2008, पृष्ठ 33–35. ↑ "A Shi'ite Encyclopedia". Al-Islam.org. Ahlul Bayt Digital Islamic Library Project. अभिगमन तिथि 27 February 2018. ↑ Musnad Ahmad Ibn Hanbal, Volume 4. पृ॰ 281. ↑ al-Razi, Fakhr. Tafsir al-Kabir, Volume 12. पपृ॰ 49–50. ↑ "Abar Ali mosque". IRCICAARCH data. मूल से April 2, 2015 को पुरालेखित. अभिगमन तिथि May 23, 2015. ↑ Ibn Abi al-Hadid, Sharh; Vol. II, p.5. Nahj Al-Balagha Nahj Al-Balagha Sermon 3 Archived सितंबर 23, 2009 at the वेबैक मशीन. ↑ Nahj al Balagha Sermon 72 Archived मई 7, 2013 at the वेबैक मशीन. Nahj Al-Balagha Sermons 8, 31, 171, 173, Archived सितंबर 27, 2007 at the वेबैक मशीन. ↑ Mikaberidze, Alexander. Conflict and Conquest in the Islamic World: A Historical Encyclopedia. पृ॰ 836. ↑ Mikaberidze, Alexander (2011). Conflict and Conquest in the Islamic World A Historical Encyclopedia [2 volumes] A Historical Encyclopedia. ABC-CLIO. पृ॰ 836. आई॰ऍस॰बी॰ऍन॰ 978-1-59884-337-8. ↑ Sandler, Stanley (2002). Ground Warfare An International Encyclopedia. ABC-CLIO. आई॰ऍस॰बी॰ऍन॰ 978-1-57607-344-5. अभिगमन तिथि 2013-04-30. ↑ "Politics in two Schools". Al-Islam.org (अंग्रेज़ी में). अभिगमन तिथि 2017-04-11. ↑ अ आ इ "Hazrat Ali (A.S.): His Poor Subjects and Pro-Poor Government || Imam Reza (A.S.) Network". www.imamreza.net. मूल से April 12, 2017 को पुरालेखित. अभिगमन तिथि April 11, 2017. ↑ "Silk Road Seattle - Balkh". मूल से March 3, 2016 को पुरालेखित. ↑ "Spiritual Foundation". www.spiritualfoundation.net. मूल से 16 February 2007 को पुरालेखित. ↑ "حفظت سبعين خطبة من خطب الاصلع ففاضت ثم فاضت ) ويعني بالاصلع أمير المؤمنين عليا عليه السلام " مقدمة في مصادر نهج البلاغة Archived जून 17, 2015 at the वेबैक मशीन. ↑ Sources of Nahj Al-Balagha Archived नवम्बर 23, 2012 at the वेबैक मशीन. ↑ "Sermons without 'dot's and 'Alef'" (फ़ारसी में). मूल से April 6, 2017 को पुरालेखित. अभिगमन तिथि April 6, 2017. ↑ "Sermons without dot/ Christian George Jordac: This sermon is a masterpiece". www.khabaronline.ir (फ़ारसी में). मूल से April 28, 2016 को पुरालेखित. अभिगमन तिथि April 9, 2017. ↑ अ आ Al-Kulayni, Abu Ja’far Muhammad ibn Ya’qub (2015). Kitab al-Kafi. South Huntington, NY: The Islamic Seminary Inc. आई॰ऍस॰बी॰ऍन॰ 9780991430864. ↑ Ali ibn Abi Talib (1990). Supplications (Du'a). Muhammadi Trust. पृ॰ 42. आई॰ऍस॰बी॰ऍन॰ 978-0-9506986-4-9. ↑ "Karbala's Martyrs". मूल से January 4, 2009 को पुरालेखित. ↑ List of Martyrs of Karbala Archived जून 29, 2012 at the वेबैक मशीन. by Khansari "فرزندان اميراالمؤمنين(ع): 1-ابوبكربن علي(شهادت او مشكوك است). 2-جعفربن علي. 3-عباس بن علي(ابولفضل) 4-عبدالله بن علي. 5-عبدالله بن علي العباس بن علي. 6-عبدالله بن الاصغر. 7-عثمان بن علي. 8-عمر بن علي. 9-محمد الاصغر بن علي. 10-محمدبن العباس بن علي." ↑ Steigerwald (2008), पृ॰ 375. ↑ Naseri, AliAkbar. Imamat and Shifa'at. पपृ॰ 203–204. ↑ Feyrahi, Davoud. "General coordinates of Imaamat". Shia Studies Quarterly (3 and 4). मूल से December 10, 2015 को पुरालेखित. ↑ अ आ इ Leaman, Oliver (2006). The Quran: an Encyclopedia. Taylor & Francis e-Library. पपृ॰ 28–31. आई॰ऍस॰बी॰ऍन॰ 978-0-415-32639-1. ↑ अ आ इ Hamid, Mavani (2013). Religious Authority and Political Thought in Twelver Shi'ism. New York and London: Routledge. पपृ॰ 68–73. आई॰ऍस॰बी॰ऍन॰ 978-0-415-62440-4. ↑ Ibn Kathir. 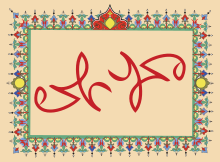 Al-Bidāya wa-n-nihāya. 5. Dar al-kotob al-Elmie. पृ॰ 245. ↑ Muhammad ibn Jarir al-Tabari. Tafsir al-Tabari. 13. Dar al-fekr Publication. पृ॰ 27. ↑ Muhammad ibn Jarir al-Tabari. Tafsir al-Tabari vol. XXII. pp. 5–7. ↑ "ĀL-E ʿABĀ". मूल से October 18, 2014 को पुरालेखित. ↑ Flaskerud, Ingvild (2010-12-02). Visualizing Belief and Piety in Iranian Shiism (अंग्रेज़ी में). A&C Black. आई॰ऍस॰बी॰ऍन॰ 9781441149077. ↑ "Iranians to celebrate Father's Day". 9 April 2017. ↑ "Iran Public Holidays 2018". ↑ "Ali". Sunnah. मूल से April 3, 2015 को पुरालेखित. अभिगमन तिथि May 14, 2015. ↑ "Khalifa Ali bin Abu Talib - Ali, The Father of Sufism". Alim.org. मूल से November 13, 2013 को पुरालेखित. अभिगमन तिथि December 31, 2013. ↑ Flaskerud, Ingvild. Visualizing Belief and Piety in Iranian Shiism (अंग्रेज़ी में). A&C Black. आई॰ऍस॰बी॰ऍन॰ 9781441149077. अभिगमन तिथि 11 April 2017. ↑ "A Glance at Historiography in Shiite Culture". Al-Islam.org. Ali ibn Abi Talib (1984). Nahj al-Balagha (Peak of Eloquence), compiled by ash-Sharif ar-Radi. Alhoda UK. आई॰ऍस॰बी॰ऍन॰ 978-0-940368-43-9. "Shadow of the Sun" published on first Shia Imam, a collection of 110 hadiths from Prophet (s) concerning the character of Ali.